The Sony Xperia C5 Ultra was officially announced today, and what we have in our hands is an Android-powered phablet made for snapping selfies. This mid-range smartphone also stands out for its bezel-less design and slender 8.2 mm thin profile. The phone's front is occupied by a large, 6-inch IPS LCD display with a resolution of 1080 by 1920 pixels. By trimming the side bezels as much as possible, Sony has managed to achieve a width of 79.6 millimeters for the Xperia C5 Ultra, which we hope will make it not so difficult to grasp. Unfortunately, features like water resistance and stereo speakers are not listed in the device's specs sheet. Black, white, and mint green are the three colors the Xperia C5 Ultra comes in. But one of the most exciting features of the Sony Xperia C5 Ultra are its cameras. We said "cameras" because both the front and the rear one seem to pack plenty of potential. On the front of the C5 Ultra resides a 13MP autofocus Exmor RS camera with a 22 mm focal length and an 88 degree field of view. In plain words, you'll be able to effortlessly fit a whole bunch of people into the frame and capture a photo in great clarity. On top of that, you get a soft LED flash at the front to illuminate those darker selfies. As for the Xperia C5 Ultra's main camera, it has the same 13MP of resolution, Exmor RS sensor, and a soft LED flash. The focal length and viewing angle, however, are slightly different, at 25 mm and 80 degrees respectively. Neither of the two cameras feature optical image stabilization. They both rely on software to keep the frame steady. On the hardware side of things, we find a 64-bit, octa-core MediaTek SoC inside the Sony Xperia C5 Ultra. The MTK6752 is the chip in use, with a 1.7GHz maximum clock speed, an ARM Mali760 MP2 GPU maxing out at 700 MHz. 2 GB of RAM and 16GB of on-board storage have also been thrown in, along with a microSD card slot that accepts cards of up to 200GB. You'd expect a phone of this size to have a massive battery inside it, but that's not exactly the case with the Sony Xperia C5 Ultra. Its non-removable battery cell has a capacity of 2930mAh, which is exactly what the smaller Xperia Z3+ has at its disposal. Nevertheless, Sony is promising up to 2 days of mixed usage on a single charge. Sony's own Stamina mode is available and prolongs the phone's stand-by time when activated. On the software side, you have Android 5.0 Lollipop running on the Sony Xperia C5 Ultra, and on top of Google's software we see Sony's well-known custom Android skin. One of the additions to the software is the so-called mini mode, which shrinks the UI down to 4 inches for improved single-handed use. This mode is activated by sliding a finger diagonally. 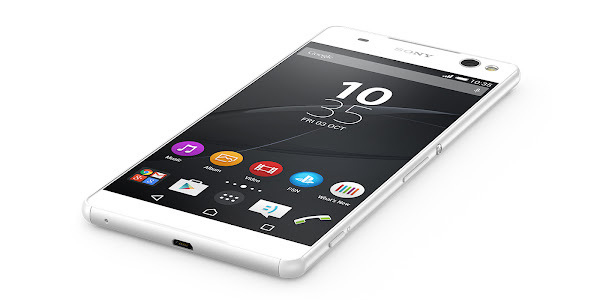 The Sony Xperia C5 Ultra will be available in selected countries across emerging markets from mid-August. Both single- and dual-SIM variants of the phone will be released.